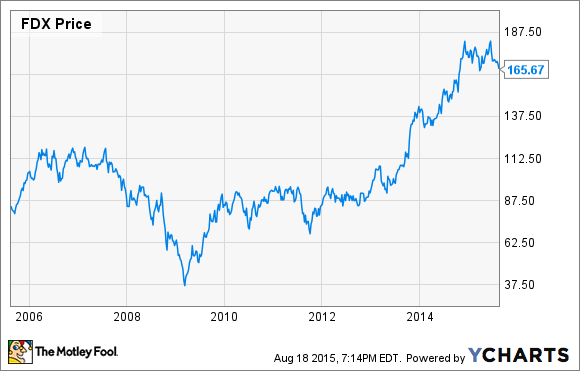 Is FedEx Stock a Buy? 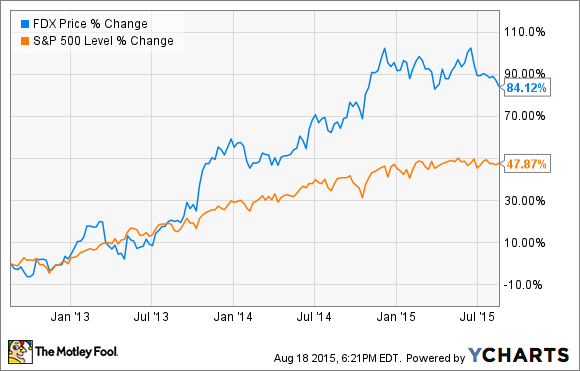 Is the package delivery giant getting credit for its earnings growth potential? Shares of FedEx (NYSE:FDX) have nearly doubled over the past three years, easily outperforming the broader market. However, FedEx stock has recently pulled back a little more than 10% from the all-time high reached earlier this year. Does this make it a good time to buy? While FedEx's valuation is roughly in line with the market's on a backward-looking basis, at 18.5 times adjusted trailing earnings the stock looks quite attractive, especially with FedEx's profit growth potential. Between completing its multi-year restructuring, growing its Ground business, and expanding in Europe through the acquisition of TNT Express, FedEx has plenty of "self-help" opportunities for profit growth. Meanwhile, it can wait for global economic growth to pick up. In the years prior to the Great Recession, the FedEx Express business -- the cornerstone of the company -- routinely posted a high single-digit operating margin. However, over time, the division's cost structure became bloated. As a result, when demand didn't bounce back as much as expected following the recession, it crushed the division's operating margin. By fiscal 2013, the FedEx Express operating margin was down to just 3.4% -- or 4.3%, excluding some one-time charges. This was a major reason why FedEx stock languished below its pre-recession high until late 2013. To turn this situation around, FedEx outlined a bold cost-cutting plan in late 2012. By the end of the current fiscal year, this restructuring is expected to improve FedEx's profit by $1.6 billion annually, mainly in the Express division. In the most recent fiscal year, which ended in May, FedEx Express' adjusted operating margin had already bounced back to 6.8%. Most notably, it achieved this margin expansion with almost no revenue growth. FedEx is on track to complete its restructuring during this fiscal year. This should get the Express division's operating margin back to its historic highs. FedEx will continue to replace lots of older aircraft with cheaper-to-operate Boeing 767s beyond fiscal 2016, though, which should help boost Express operating margin into double-digit territory in the next few years. While the FedEx Express segment is a turnaround story, FedEx Ground has been a consistent growth business over the past decade. Not only is it riding the rising tide of e-commerce, FedEx Ground has also been steadily increasing its market share. FedEx Ground revenue has risen about 10% annually in recent years. Operating income hasn't grown quite as quickly due to some modest margin pressure; however, the margin decline was caused by the heavy investments FedEx has been making in the Ground business. As the FedEx Ground business continues growing -- as it almost certainly will -- it should be able to leverage those fixed costs to start growing its operating margin again. A shift in FedEx Ground's pricing strategy implemented earlier this year and some upcoming efficiency-boosting software tools will also help on the margin front. A third key driver that should lift FedEx stock in the coming years is the pending acquisition of TNT Express. TNT has a much more robust delivery network in Europe than FedEx, but FedEx has a far stronger global footprint. Combining the two would increase their competitiveness in Europe, creating a new growth opportunity for FedEx. Assuming that regulators approve the purchase -- which is not guaranteed -- FedEx should be able to steadily gain market share in Europe in the coming years, just as the FedEx Ground segment has consistently gained share in the U.S. The timing is also good. While the weak euro has put a damper on imports to Europe, trade within the continent is as strong as ever, and consumers in the U.S., China, and elsewhere are buying up cheaper European goods, driving up export volume. FedEx management has projected that adjusted EPS will reach $10.60-$11.10 in fiscal 2016, up 21% at the midpoint from $8.95 a year earlier. Analysts also expect EPS to rise by double digits again in fiscal 2017, with the consensus estimate currently at $12.47. Earnings growth may slow somewhat after that. That said, FedEx Ground will continue to be a source of revenue and profit growth for the foreseeable future, and by 2017 the TNT acquisition (if approved) should start bearing fruit, too. Finally, FedEx stock is often seen as a bellwether for the economy as a whole. However, the company's earnings and stock price have outperformed in spite of -- not because of -- global economic conditions in the past couple of years. When the global economy finally gets back on track, it should boost FedEx's business. FedEx thus appears to have better short-term and long-term earnings growth prospects than most companies. As a result, FedEx stock should probably be trading at a premium to the market earnings multiple right now, suggesting that the stock may be a good buy.